Why do I need a header over my frameless shower door? 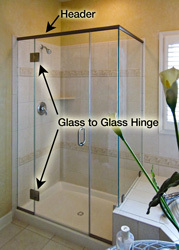 Headers are used when a fixed glass panel is hinged to an adjoining glass door. By hinging it, it's being asked to carry the weight of the shower door. Every time the glass door is opened, it pulls on the attached glass panel. A support header relieves some of the tension to prevent weakening of the glass-to-glass connection over time. Headers are not necessary if the glass door attaches into a wall. What components go into planning my frameless shower design? What's the difference between a shower grab bar and a towel bar?